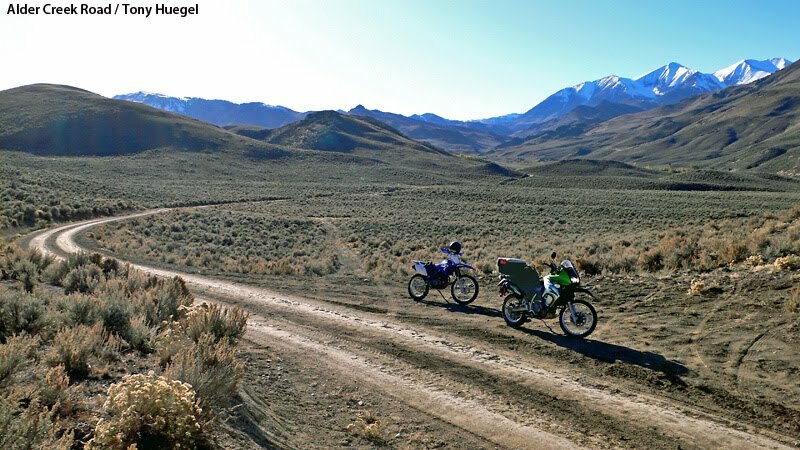 Backcountry Byways LLC: Mackay, Idaho: Mo' betta than Moab? Mackay, Idaho: Mo' betta than Moab? MACKAY, Idaho -- Move over, Moab. 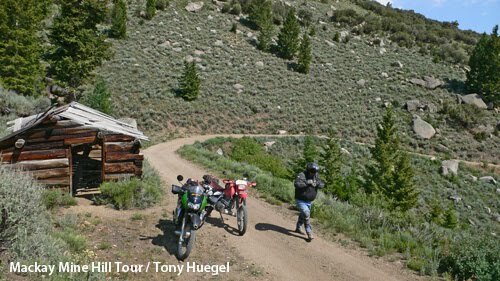 This scenic Idaho ranching town -- founded on mining long ago yet rich today in outdoor recreation and small-town charm -- is hot on your wheels.That's the impression I gained during four days of riding adventure motorcycles in the lofty mountains surrounding this yet-to-be-discovered rival to Utah's mecca for dirt-road adventure. 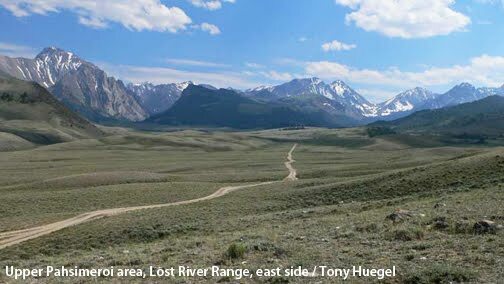 Located on the Big Lost River in Custer County (Google Map), in the shadow of Idaho's Lost River Range -- Idaho's highest -- little Mackay (MAC ee) is accommodating to ADV and dirt-bike riders, ATVs, SUVs, mountain bikes and hikers alike. So a fellow adventure-motorcycle rider, Dave, and I allocated four days to exploring the region's mountains and valleys via a vast network of dirt roads that rivaled the best of the northern Rockies. We traveled on dual-sport motorcycles ... he on his Honda 650, I on my Kawasaki KLR 650. We unloaded our bikes and checked in at the Wagon Wheel Motel -- convenient, comfortable, reasonably priced and well-kept. After a long day of exploring, we could sit out each evening and gaze at the towering, 12,000-foot-plus Lost River Range just east of town. For lucky Idahoans who can make Mackay a day trip, the city has an accessible staging area complete with vault toilets, shaded tables and signs explaining the rules for all-terrain use. It's conveniently located near the center of town, which is bisected by US 93 and gives "unplated" vehicles limited access to some city streets. For longer stays, this quiet little mountain town has a grocery store, cafes, restaurants, fuel, a Salmon-Challis National Forest office, a lovely city park and a couple of charming motels. Camping abounds in the area as well, if you're willing to stock up on last-minute items in town and travel unpaved adventure roads into the surrounding wildlands, which my family and I have done many times during our 25 years in Idaho. Best of all is Mackay's proximity to a spectacular and accessible network of dirt roads and trails from the region's ranching and bygone mining days. Two-track, native-surface and graveled county roads wind for long miles through diverse landscapes, among them conifer forests, narrow canyons, steep mountain slopes and high glacial valleys. To the east soars the steep, dramatic escarpment of the Lost River Range, Idaho's highest, which includes Idaho's champion peak, Borah. Just beyond the Lost River Range, lies the broad and semiarid Pahsimeroi (pahSIMMERoy) and Little Lost River valleys, which are akin to Nevada's basin-and-range country. There, the upper reaches of the Pahsimeroi River drain the sparkling lakes and glistening snowfields of a cluster of angular peaks. Immediately west of town are the forested White Knob Mountains and the glaciated Pioneers. The former are the namesake of the White Knob Challenge mountain bike race, and the locale of the old mountain roads that make up the Mackay Mine Hill Tour. They include dirt-road accessible hideaways like Copper Basin, Muldoon and Wildhorse canyons. 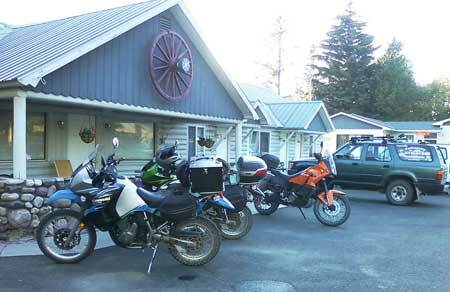 Here's a roundup of our rides, done on 650cc dual-sport bikes. To locate the route and plan your own visit, I recommend Benchmark Maps' Idaho Road & Recreation Atlas advance planning, and a foldable Salmon-Challis National Forest Visitor Map for on-site navigation. Copper Basin loop. From US 93 north of Mackay, we made our way to Fish Hatchery Road, and then to single-lane Burma Road. Burma Road ascends in a serpentine and highly scenic manner from the valley into the White Knob Mountains, passing spectacular overlooks along the way. It connects to Copper Basin Loop Road. After making the loop through this basin below glaciated peaks, we exited to the southeast over Antelope Pass (8,934 ft.) and Bear Creek Summit (7,660 ft.) via beautiful Cherry Creek Summit Road (135). One word of caution: In spring, there is a north-facing shaded spot just below Antelope Pass where late-season snowdrift can block the road. 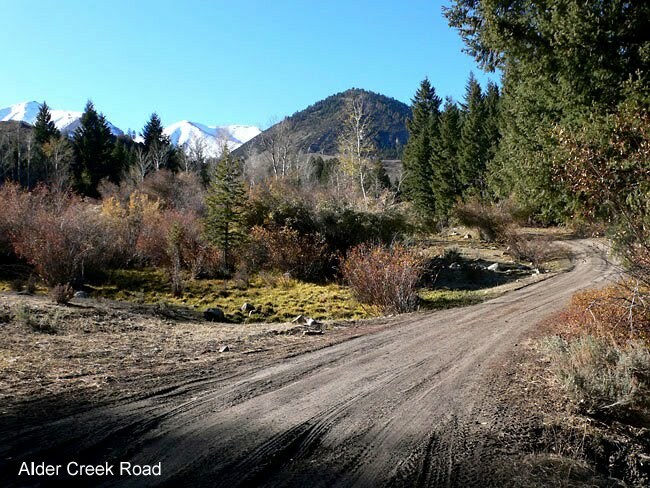 We returned to US 93 and Mackay via Antelope Creek Road, a maintained dirt-and-gravel road. Salmon River country. From U.S. 93, we turned west onto Trail Creek Road, and in a few miles turned northwest onto meandering Walker Way. This remote single-lane road took us up, over and through low, rolling foothills, to connect with paved East Fork Road, along the East Salmon River. We continued southwest to dirt Big Boulder Creek Road (667/669), which took us past the hideous abandoned mining operations at Livingston Mill and Livingston Mine. We attempted to ride up to Railroad Ridge on the rough, rocky and narrow road, which I'd driven on before in my 4Runner, but found it too rough and turned back. From there we rode to beautiful Idaho Highway 75, and followed it along the Salmon River. After a quick look at the off-limits ghost town of Bayhorse, which signs warned is a hazardous-waste site, we continued to Challis for gas and the to the hamlet of Ellis. 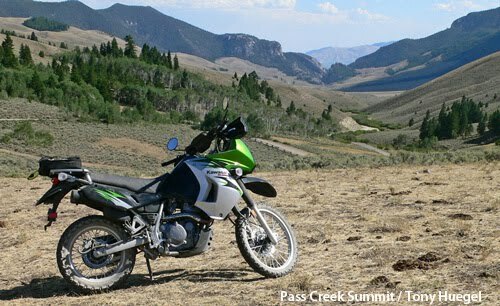 We turned southeast there, and rode the long, empty length of Pahsimeroi Valley to Doublespring Pass Road. This beautiful ride took us over the road's namesake pass, and toward U.S. 93, below the ramparts of Borah Peak (12,662 ft.) and across the visible break in the Earth's crust left by the magnitude 6.9 Borah Peak earthquake in 1983. Pahsimeroi and Little Lost River valleys. South of Mackay, Pass Creek Road gives the mistaken impression of going east. Instead, it goes directly north from U.S. 93 to follow Pass Creek through a narrow, high-walled gap through the Lost River Range (with primitive campsites here and there). 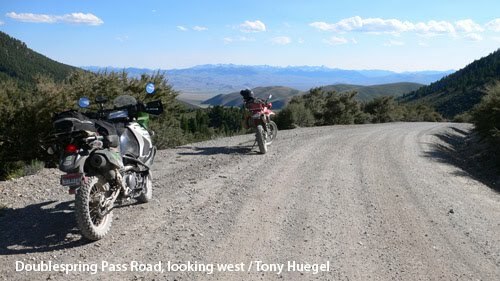 We rode over Pass Creek Summit (7,637 ft.), turned northwest onto Dry Creek Road (119), and managed to connect with Burnt Creek and then Upper Pahsimeroi Road. Now in the Pahsimeroi Valley, a two-track ranching road took us west on benchlands that drained into the valley's small, namesake river, which flows down from the one of the most inspiring mountain valleys in Idaho. Rather than take the rocky road that leads to the river, however, we turned northwest and made the gentle ascent over Horse Heaven Pass, which provides views of glacial canyons and terminal moraines on the east slope of the range. From Horse Heaven Pass we continued to Doublespring Pass, then back to Mackay, dinner, and our chairs for an evening recounting the day's highlights. Mackay Mine Hill Tour. As in so many places throughout the Rocky Mountains, miners left not only unsightly ruins and toxic waste heaps, but a network of little backroads and other dirt tracks. Today, these roads still wind up into and through the White Knob Mountains, providing an alluring, easy yet exhilarating couple of hours. (Free maps of the Mackay Mine Tour are available locally.) Dave was drawn all day to one road in particular -- Alder Creek Road -- which I'd never been on. So, done with the mine tour, we opted to follow its looping route to its junction with US 93 south of Mackay. Narrow, serpentine and gloriously scenic, it took us through canyons and across ridges, then down into wooded draws and open pastures. It was a triumphal conclusion to our trip -- the first of many to come.